Hello and welcome. Congratulations on your new blog – or even your new resolution to start a blog. You are in for a treat. It will enrich your life in more ways than you can think of. I’m moved, though, to write to you because I’ve been blogging for a very, very long time. Almost a decade which is a couple of generations in blog years. Lately though the new bloggers I’ve met have made me a little sad. Not their blogs which are slick and beautiful, but the people themselves. The talk is all of niche and brand, of monetisation, marketing and value propositions. A couple of wannabe bloggers even told me they don’t have time to get started. That things aren’t ready because the time and energy to negotiate something as basic and necessary as a logo was already feeling like a hurdle. I guess they’ve never heard of Logojoy? It’s like blogging has transformed from school disco (circa 1982 when leg warmers and enthusiasm were enough) to prom (when nothing is enough) and no one can decide which shade of fake tan to spray. I fear that you’ve missed the point. Blogging is supposed to be fun – creative, expressive, communicative – but most of all fun. Unless, of course, metrics and media packs are your idea of fun. There’s plenty of space in the blogging world – shapes, sizes, colours and stripes. Do your thing, you’re welcome. And it’s absolutely fine that you’re doing this to make a coin or forge a career. But please, please don’t wait, don’t let the idea that it has to be perfect hold you back. It doesn’t do any harm to keep the tenets of professional marketing at hand, for very occasional reference, but remember that when professionals talk about blogging they’re meaning a certain type of content that they “deploy” “tactically” alongside a whole bunch of other stuff like infographics, videos and carefully planned corporate tweets. Personal blogging done right is a totally different beast – it’s unstoppably sharing the ups and downs, the truths and tales. Once you get a taste for it, and how it feels to find your voice, it’s addictive. Blogging (the heart and soul kind) is an evolution. Few of us were hatched ready to fly. How do you know what it’ll feel like to blog until you blog and feel it? Waiting until you’ve crafted the perfect logo and matching Pantone scheme means you’re wasting time. Write it, vlog it, post it then change it later. Learn, develop and have a blast. A geriatric blogger who has learned that almost everything is improved by a good blog. Thanks very much, Leigh. That’s just it – blogging should be personal. I really enjoyed reading this – thank you! 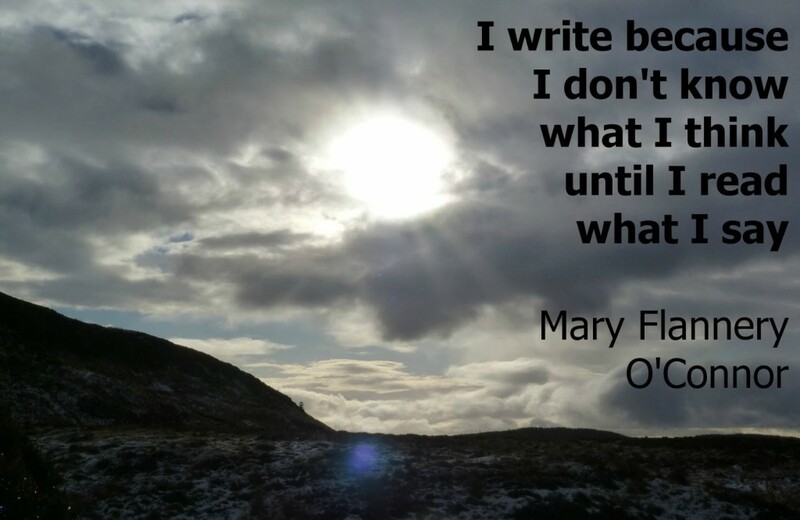 And that quote sums up my attitude to writing perfectly. I do write to figure out what I’m thinking! Thanks, geriatric blogger. I’m (very) newish and I spent a long time working up to it. Hi Katie, Thanks for your comment. Your blog looks great – I hope you enjoy it. Just read ‘in a bun dance’for first time today. Now starting to catch up on all your others. Really like them. Keep ’em coming! !